Wednesday 10th April was the regular meeting of Wike Mark Lodge no 142 and the Lodge took the opportunity of inviting a number of non-Mark Masons with the purpose of explaining to them what the Mark Degree is all about and why we all enjoy it so much. Officers of the year. Several of the Mark visitors assisted by taking office for the evening. The business of the meeting was efficiently handled and the Lodge closed in a timely manner. Nine Craft Masons, who were not members of the Mark Degree, then joined us in the Lodge Room and listened to a brief talk given by VWBro John Smith which was very inspiring indeed. This was followed by a slide show about the history and other aspects of the Mark Degree given by WBro David Rainford, Provincial Secretary. Bro. 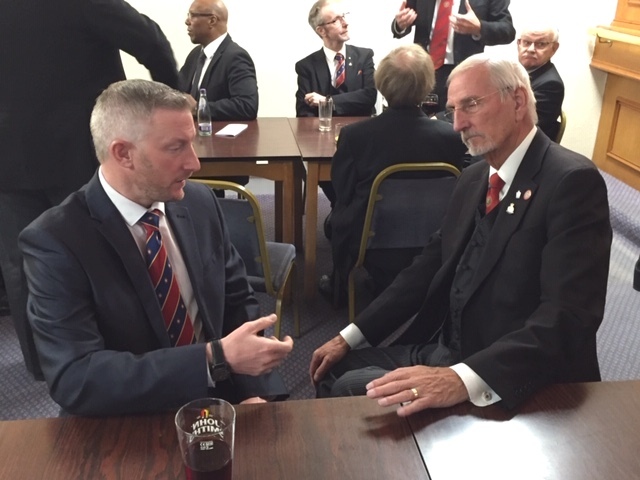 Thomas Crompton, the newest member of Wike Mark Lodge, then addressed the visitors explaining with great meaning, why he enjoyed the Mark Degree so much and how he regretted not joining many years earlier. Afterwards, we retired to the bar and dining room for a splendid buffet and as this was very informal, the Mark members spent very helpful time chatting to the visitors, answering their questions and adding to what had been said in the Lodge. The meeting concluded shortly after 9.00pm with many of the visitors expressing an interest in joining our happy and friendly Order.